The Boston Tea Party of 16 December 1773 is what sparked the American Revolution. Yes, many other incidents preceded it, but the reaction to it by the British government led to the armed conflict and, ultimately, independence. George III’s government was so incensed by the Tea Party that it decided to teach Massachusetts a lesson, one that would crush the “rebellion” and warn all the other colonies that they had better not try anything similar. The government’s action, though, had exactly the opposite effect, as now all the other colonies knew they would suffer the same fate unless they banded together. Rather than crush a perceived rebellion, the acts passed by Parliament drove all the colonies into outright resistance. The reaction went by the name of the Coercive Acts (that was Parliament’s title, not the colonies’—they called them the Intolerable Acts). The first one was the Boston Port Bill, which effectively shut down the Boston harbor. Intent? To starve the Bostonians into submission. 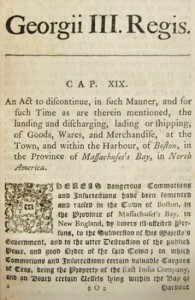 The second provision—the Massachusetts Government Act—changed the upper branch of the Massachusetts legislature into one appointed by the royal governor rather than the elected Massachusetts lower house. The governor also was empowered to appoint and remove judges at his whim and town meetings were restricted to one per year, and the only action to be taken at these meetings was to elect town officials—no debates on policy allowed. 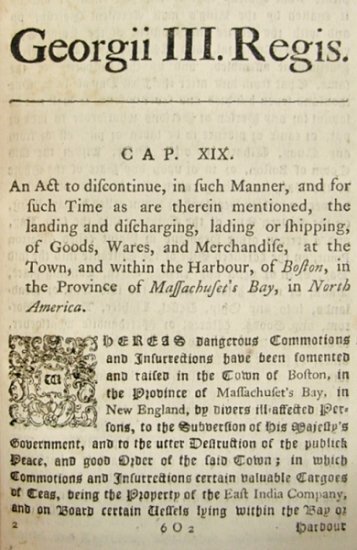 The Administration of Justice Act—the third of the Coercive Acts—required any British official in Massachusetts who was indicted for a capital offense to be tried in Britain rather than in the colony; the other half of the act sent any colonist who opposed the governor over to Britain for trial. The last of these measures was the Quartering Act, permitting soldiers to be housed in private homes without consent of the owners. While not considered part of the Coercive Acts by the British, another measure that passed at the same time, the Quebec Act, was also roundly criticized in the colonies. That act pushed the boundary of Quebec down to the Ohio River, thereby mandating that anyone who moved into that area would be in a colony that had no representative government. It also gave religious toleration to Catholics, something that the distinctly Protestant colonies still feared due to a long history of warfare between Catholic and Protestant. Massachusetts had been the target but all the colonies now felt directly threatened. What were they to do in response? In effect, it forced them to unite, convening the First Continental Congress. That Congress made some very important decisions. More on that in a future post.